Zoom! Whitening is the latest in teeth whitening technology. It is safe, effective and fast. Zoom! can achieve up to 8 shades lighter in 45 minutes. With a single treatment you will have that bright, confident smile you have always dreamt of. Zoom! is a comfortable in-office whitening procedure. It utilizes Zoom! gel that is a light activated hydrogen peroxide-based bleaching agent. A specialized Zoom! light activates the hydrogen peroxide, aiding the bleaching agent in order to lighten discoloration of enamel and dentin. teeth exposed throughout the procedure. napkin is placed under the retractors. whitening gel is irritating to soft tissue. 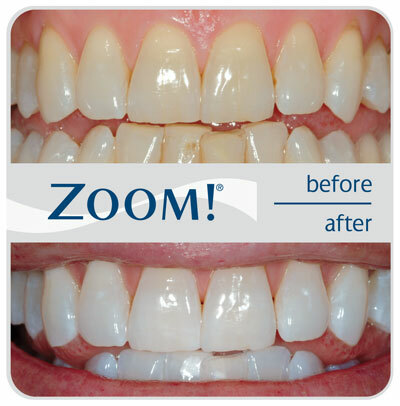 Zoom whitening gel is applied to your teeth. on your teeth for 3 fifteen minute sessions. structure by activating the gel. Finally, your teeth will be many shades whiter.